A good-looking, intelligent take on one of the world's most individual guitars - sonic experimentalists will love it. We love the Oxblood finish. Useful tweaks make it a playable beast. Great build quality. Excellent tones. 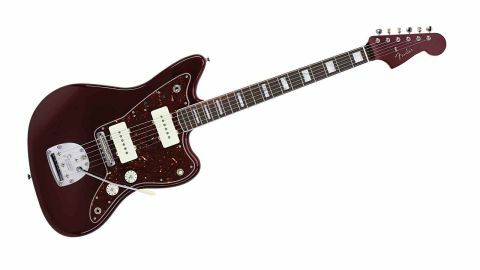 J Mascis, Lee Ranaldo and Thurston Moore have all had a hand in reshaping the Jazzmaster, and Queens Of The Stone Age/A Perfect Circle guitarist Troy Van Leeuwen is the latest alt-rocker to add his name to Fender's signature list. "A number of aesthetic and practical alterations make it an altogether more usable beast"
Although a relatively recent convert to the Jazzmaster (his previous signature model was the discontinued Yamaha SA503 TVL semi), Van Leeuwen has appointed his 'master with a number of aesthetic and practical alterations that make it an altogether more usable beast. The first draw is the gloss polyester Oxblood finish, with matching headstock. It's a classy look in conjunction with the four-ply tortoiseshell pickguard. Aside from the finish, the Van Leeuwen's only real identifying mark is his signature on the rear of the headstock. Elsewhere, the TVL Jazz channels a mid-60s vibe, accentuated by block inlays, fretboard binding and 'witch hat' control knobs. There are tweaks to the playing experience, too. Van Leeuwen is a regular user of both lead and rhythm circuits, so while the rhythm roller controls return, the easily knocked slider has been replaced with a robust two-way toggle. Gone, too, is the oft-maligned string-popping Jazzmaster bridge, replaced by the more reliable Mustang version. Van Leeuwen's actual model features a Mastery bridge, but we're willing to accept the Mustang offering as a compromise. A pair of American Vintage '65 single coils fill the pickup cavities. The TVL Jazz's neck is based on a mid-60s Jazzmaster, and the gloss urethane-finished C shape acquits itself well for chunky rhythm playing, thanks to vintage-style frets and a comfortable 184mm (7.25-inch) radius. We continue to be impressed by the high standards of construction coming out of Fender's Ensenada factory, and the TVL is no exception: aside from a slightly rigid vibrato action, there's very little to fault at this price point. "This isn't a guitar for traditionalists, and Van Leeuwen's take offers a sizeable palette of sonic colours"
This isn't a guitar for traditionalists, and Van Leeuwen's take offers a sizeable palette of sonic colours. The Mustang bridge copes with all shades of aggressive styles, and offers a slight, smooth roll with the floating vibrato for Kevin Shields-style 'glide guitar'. After some string stretching, vibrato-based tuning problems were practically non-existent. The pickups channel the Jazzmaster's warmth and subtlety beautifully, with a sweet top-end that translates well to funk styles in the mixed-pickup position, and gets pretty edgy at the bridge - dial in some reverb, and you're in classic surf territory. The rhythm circuit is a love-or-hate-it feature: for some, its moody neck pickup tones may seem too dark. However, for players who ignore the circuit, there is some compensation: roll down the rhythm circuit's volume control, and the two-way toggle doubles as a killswitch, perfect for a bit of stuttering faux-tremolo action. Although Van Leeuwen plays in two heavy, riff-focused bands, his contributions are more textural than crushing, and the American Vintage single coils provide a canvas ripe for effects-based manipulation. Plug in a fuzz pedal for a rich crunch - while the pickups are no gain monsters, they're always articulate, enunciating chords with great clarity. The rhythm circuit comes into its own in more gained-up territory, with the reduced high-end presence recalling QOTSA's woolly distorted tones. Add some chorus and delay and you're in A Perfect Circle and The Cure territory. Van Leeuwen displays a clear understanding of the Jazzmaster. His Mexican-made take evokes the spirit of the American Vintage '65 model, with functionality tweaks and a stunning finish. Existing Jazz hands will love it, and its practical tweaks might just entice a few Strat or Tele users looking to spread their wings.